In 1892, with mounting pressures of a two year deadline and , urban planner Daniel Burnham successfully led the World's Fair in Chicago to completion - the biggest and most ambitious in the world at that time. Sadly, his plans that would have saved the people from a growing threat of natural calamity in Manila, a century later, could have been the real feather on his already remarkable resume. Except for a shore road, which became Dewey boulevard, now known as Roxas boulevard, the plan for Manila was not fulfilled. Typhoon Ketsana (Ondoy) dropped 455 mm (17.9 in) of rain on Metro Manila in a span of 24 hours on Saturday - the most in 42 years. 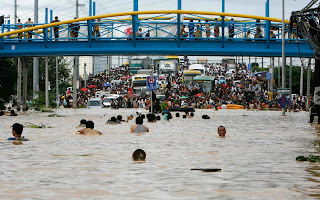 A month's worth of rainfall in a single day washed away homes and flooded large areas, stranding thousands on rooftops in the city and elsewhere. In 1977, a World Bank-funded study identified Marikina Valley, the western shores of Laguna de Bay, and the Manila Bay coastal area as among development areas that should prepare for flooding, earthquakes and possible changes in topography. In Erik Larsen's Devil in the White City, juxtaposed against the World's Fair in Chicago, where electricity literally flowed for the first time and a huge wheel by a guy named George Ferris wowed the crowd, something sinister, not unlike the works of The Ripper, was also happening that led to the gruesome deaths of possibly 200 people. In Manila, more than a century later, climate change has began to define what a serial killer really looks like.